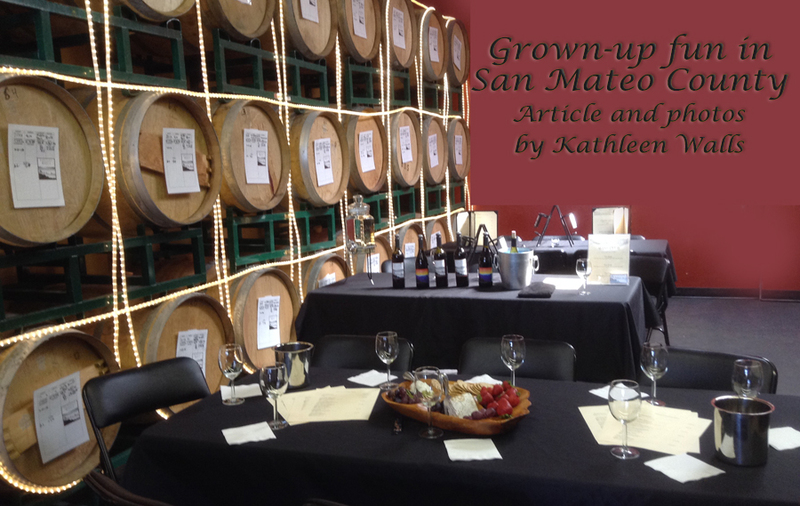 Sophisticated adults traveling in San Mateo County, California will have a lot of opportunities to taste test some of California's finest wines and craft beers right at the source. 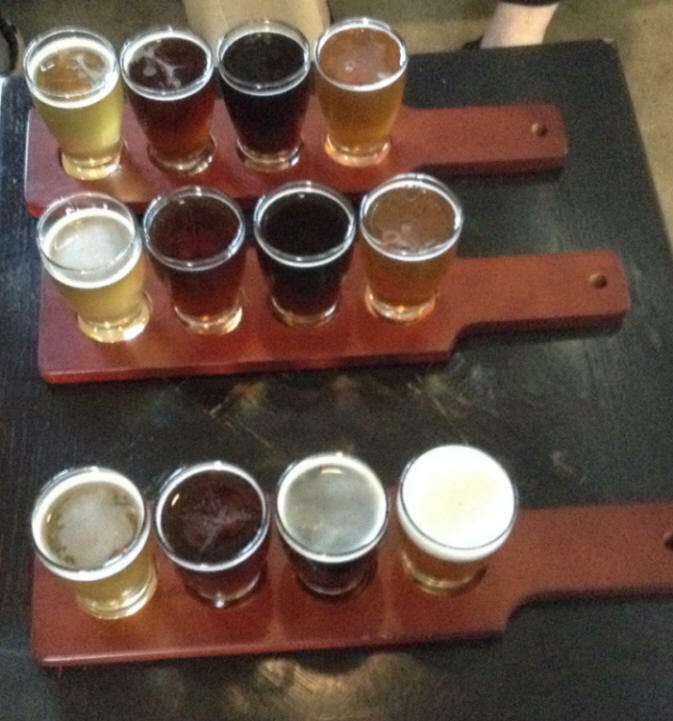 I visited there recently and found some fun tasting opportunities. Here are just a few I found on a recent IFWTWA trip. Perhaps you wouldn't think of looking for wineries and craft breweries in the middle of a industrial area but San Carlos has found a way to promote just that. They offer a downtown Wine and Beer Walk where visited some fun places. Scott Townsend told of the reasons for the wine walk which will be called Peninsula Wine Walk and include some breweries also. As he explained so often people come in and say "I never had any idea there were any wineries in the area"
Scott stated, "We are trying to raise awareness. We're not trying to get anyone a bigger slice of the pie, we're trying to make a bigger pie." We started at Cuvee Wine Cellars. The owner and winemaker, Paul Rogerville, began as a home winemaker and followed his heart. His wines are crafted after the best of the Bordeaux country wines. Since they have no estate vineyards, Paul contracts with several vineyards in the Napa Valley, Russian River area, Sonoma and others. The grapes are crushed and the wine made on site. Our hostess, Suzi Eldrige, offered us some of Cuvee Wine Cellars' favorite wines: Sauvignon Blanc, Chardonnay, Pinot Noir, Merlot and Cabernet Sauvignon. All were past winners in some prestigious competitions. Russian Ridge Winery was a cozy family operation. The entire family, Scott, Joan, and their son, Spencer Townsend, greeted us with snacks and wine. Scott told us of his start as a home winemaker. Today, they are a small winery doing things the more traditional way; they mature their wine in French oak barrels mostly rather than stainless steel. They produce around 1,000 cases annually. As Scott explained, "I had make a choice to go with my heart and make a varietal Cabernet Sauvignon or go with my wallet and make a Bordeaux Blend. I said, 'Stupid, go with your wallet.'" They do a nice Cabernet Sauvignon Merlot blend that takes out a lot of the tannin taste. 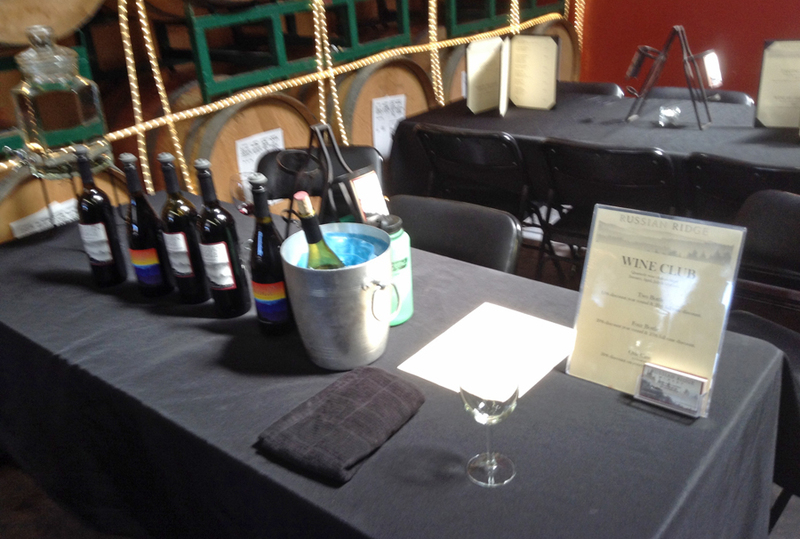 The fruity-smooth Petite Sirah and the Zinfandel were some of my favorites as well. 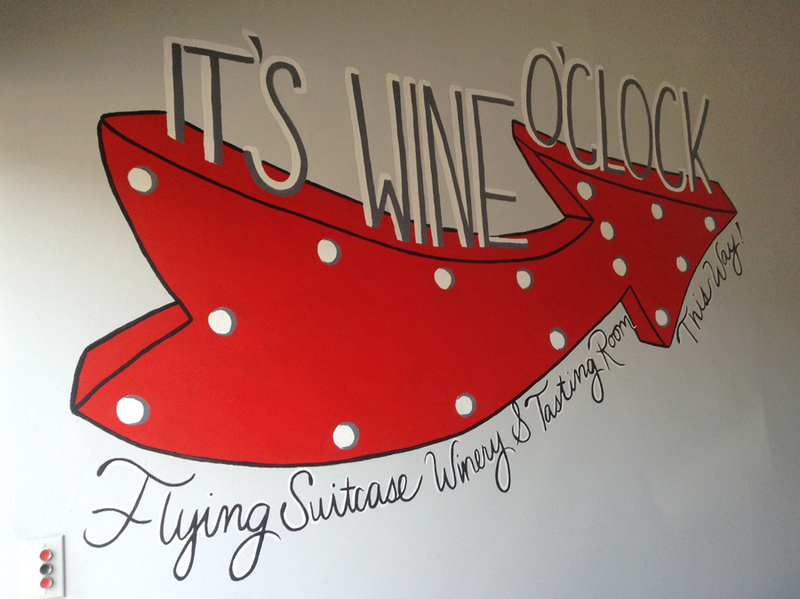 Flying Suitcase has got to be the most artistic winery ever. The walls are decorated with art complementing their Hans Christian Anderson type name. Vikki Vinther greeted us and told some of their story. Their travel theme is so fitting. She and her husband Anders moved from Denmark to California with their three-month old son, Kristoffer back in 2007. In 2012, they released their first wine, a Sauvignon Blanc. 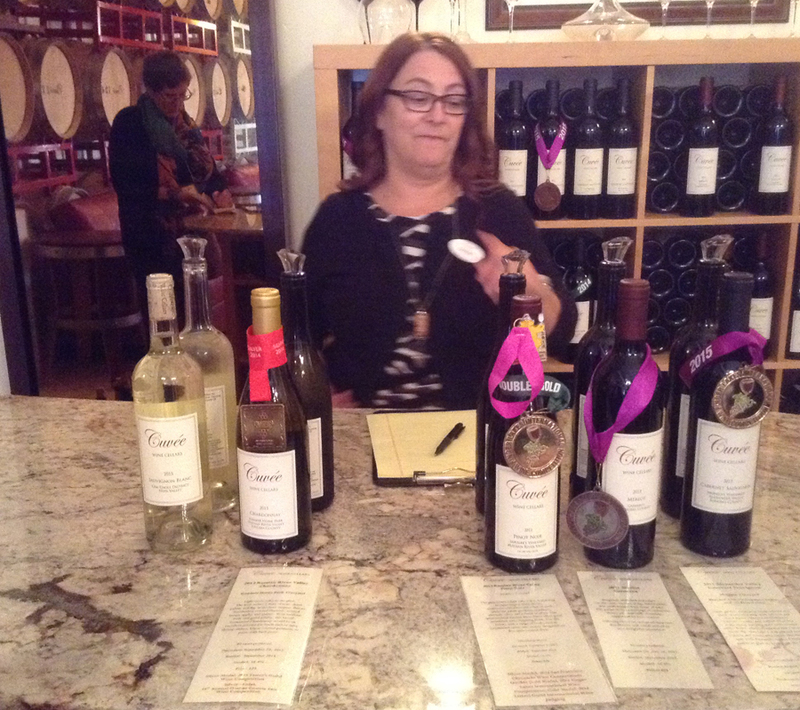 Several medals have rolled in since and they are a definite part of California's wine scene. Their wines are named to fit the travel theme; Wonderer, Wayfarer, Globetrotter, Explorer and other road friendly names. Since their young son is a part of the operation, the winery is family friendly. While the parents enjoy a glass of Crossroads or Journey, the youngsters can find plenty to do in the book and toy filled kiddy room. Domenico Winery as you might guess from the name is all about its owner's Italian heritage. Naturally Cal-Italia varietals are the focus here. Dominick and Gloria Chirichillo are renovating a big once-empty warehouse. When we visited Dominick greeted us at the spacious bar and began serving. I found my favorite right away with a 2014 Riesling. It was just off-dry and I loved the slightly sweet creamy taste. Dominick's story was equally sweet. He told of his love of wine making beginning with "My first memory of winemaking was fighting my cousins to grab the bar of my Nonno's (Grandfather's) press in Staten Island Ny. He was making wine with California grapes. So I have been making wine since I was two years old." Dominick resumed his winemaking career in 1987 after a real estate crash created some headaches in his other career he got his grandfather's press and began making wine again. He made two barrels and in a short time it turned into a co-op. Eventually he got a license and got serious. They have received about 400 awards. Dominick took us over to see the actual wine making in action. 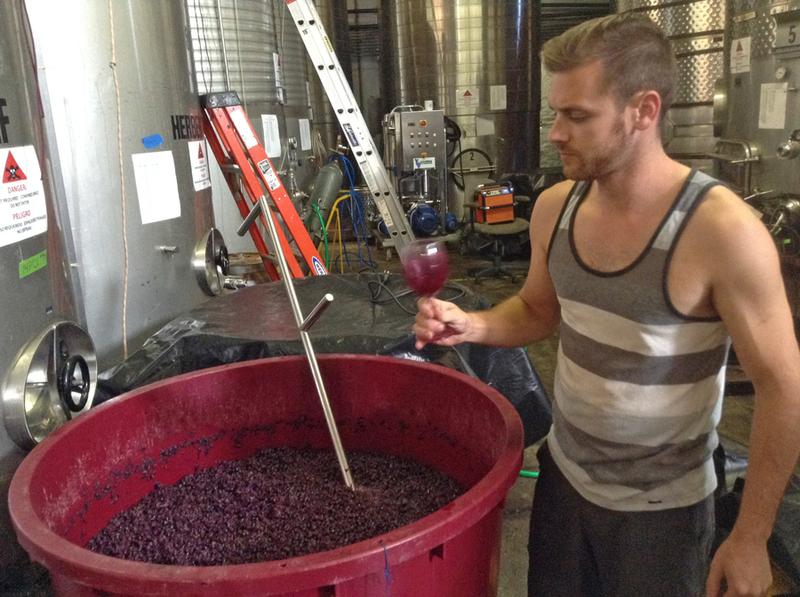 One of his assistants, Matt Hall, was busy stirring some fermenting grapes. We even got a n unusual taste of wine in its early stages. The digs today are evolving. It is a great place for events. It's large and dimly lighted with many whimsical settings. 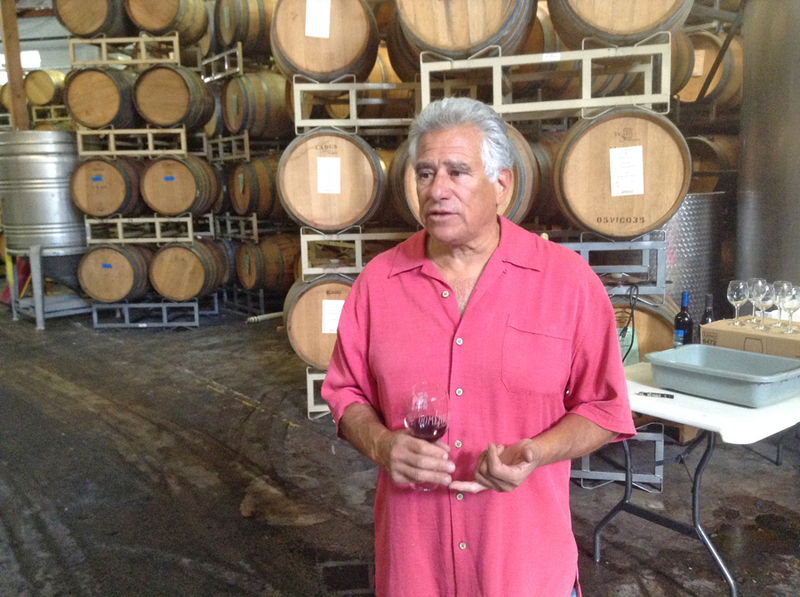 He has a small vineyard near Sutter Creek producing 5 acres of Syrah and 3 acres of Primitivo that is already being made into his wines so you can bet it will get even better if that is possible. Wine's not the only adult beverage. 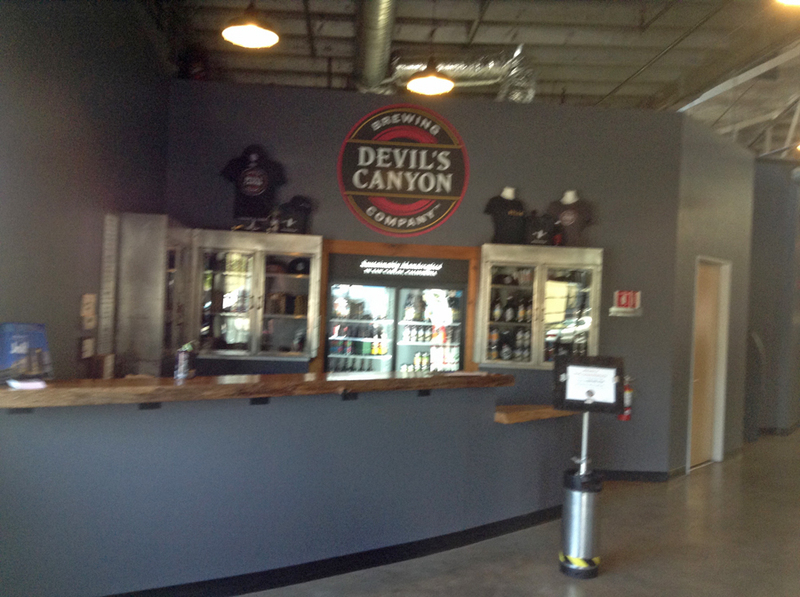 We visited Devil's Canyon Brewery and found a one-stop entertainment spot for Friday nights. It's another big warehouse conversion. So big that even after all the brewing stuff and a spacious bar, there's room for a concert stage. The brewery name came from the original Spanish name for the area, la Cañada del Diablo..
Our hosts provided a sampling of their beers. The most popular being their Full Boar Scotch Ale. The names and labels are worth a visit alone. This one shows a wild boar dressed in human clothing tending bar. For non-beer drinker and kids, they make a creamy root beer that goes down smoothly. Speaking of kids, this place is kid friendly and dog friendly. They only open to the public on Fridays and the rest of the week is spent making very special craft beers. However it is a big deal on Fridays making Devil's Canyon Brewery the go-to-spot as there are food trucks parked in the adjacent ally way serving lots of goodies. It's the place to connect with friends or enjoy a cold one. On the last Friday of the month it is a really big event with bands and entertainment. Another fact that makes this brewery special in my book is its approach to sustainability. Much of their equipment is recyled for use in the brewery. Its spent grain is given to a local farmer who feeds it to his cows. They were voted number one sustainable business in the community this year. If you are headed out from the San Francisco Airport and have a bit of time to kill, an enjoyable place to spend it is at Armstrong Brewery. It was our last stop. They offered us a sampling of six beers; Noes Gose, Kolsch, So City Brown, 415 Fog, Nitro Coffee Stout and Passion Fruit IPA. For non-beer drinkers, there is wine or soft drinks. You can also get a tasty pizza or a variety of bar food to go with your beer. The food is usually locally produced. Armstrong Brewery is housed in the cellar of the historical Fraternal Hall Building. The brewing is done behind a large glass enclosure so if you visit while brewing is being done you can watch your beer being crafted. San Mateo may be in the heart of Silicon Valley but everything here is not high tech. There are plenty of places to slow down and sample the best adult beverages created right here from the fruit of the California soil.